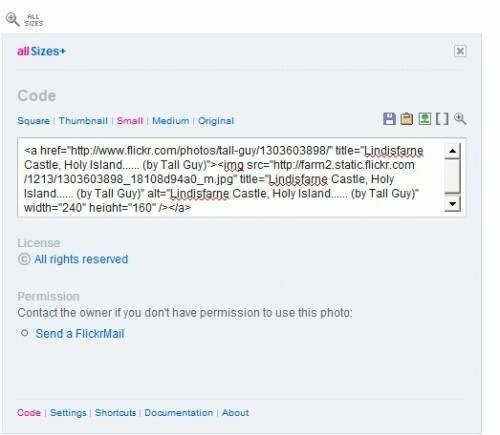 Most photos that are uploaded to Flickr are available in various sizes at the photo hosting service ranging from the original photo resolution down to medium, small and thumbnail copies of that photo. Users who upload photos can make the decision to share all available sizes of the photo with other Flickr users or only one size that is available when someone opens that photo's page on Flickr. An All Sizes link at the top of the photo indicates if the photo is available in all sizes or not. Users who want that option for all Flickr photos - even those that do not offer it by default - can install the AllSizes userscript to do so. AllSizes will add the All Sizes link to every photo that is hosted at Flickr. As you can see in the screenshot above it will overlay the photo at Flickr with the options that it provides.Different photo sizes can be selected, downloaded, copied to the clipboard or viewed. It is also possible to display the original all sizes page of Flickr instead. AllSizes is a userscript that should work in all web browsers that support userscripts.